Get ready to Glow Up. Kanye and adidas are blessing us with another Yeezy Boost 350 V2 release and it’s the perfect summer shoe. This next Yeezy release will be IN-STORE & ONLINE and with your best chance to cop being through the Finish Line app. Download the app now for Apple or GooglePlay. 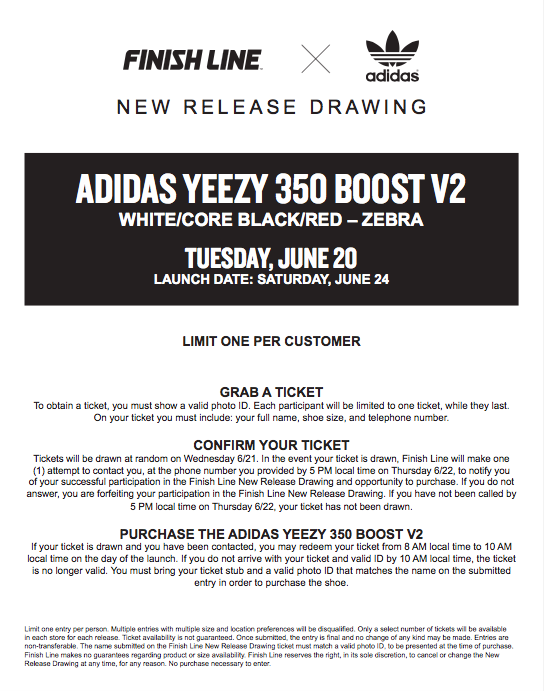 Like we have done with the previous releases, there will be an in-store raffle at select stores. 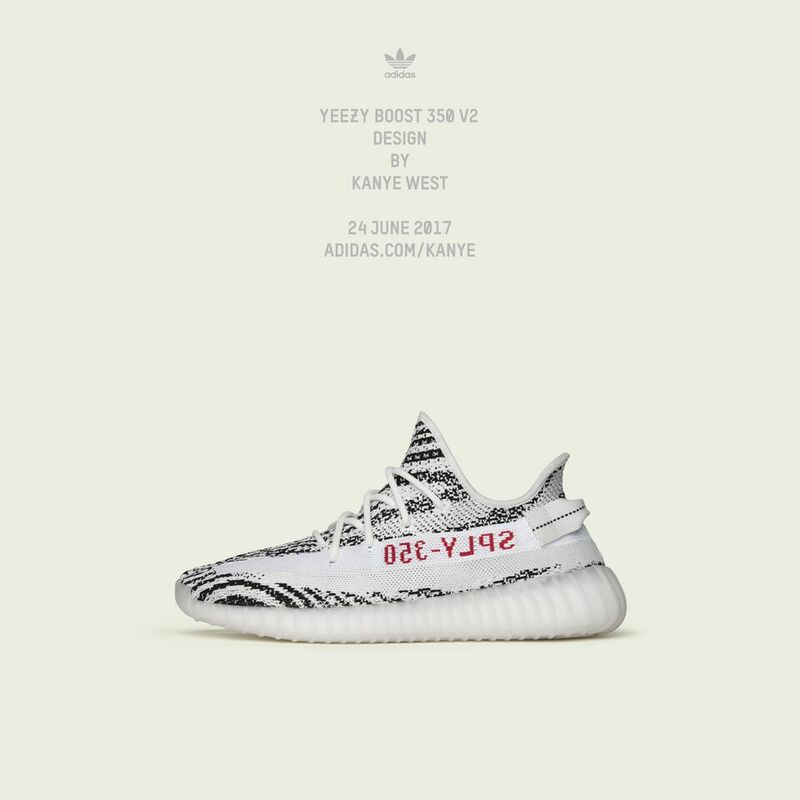 There will be sixty-nine Finish Lines across the U.S. that will be releasing the adidas Yeezy Boost 350 V2 ‘Zebra’. Make sure you check out the store list below and in-store raffle details to make sure you don’t miss out on snagging your pair. Finish Line Shoe Store San Francisco Centre. California. Finish Line Shoe Store The Shops At Montebello. California. Finish Line Shoe Store Northridge Mall. California. Finish Line Shoe Store Stonewood Center. California. Finish Line Shoe Store Victoria Gardens. California. Finish Line Shoe Store Shops At Mission Viejo. California. Finish Line Shoe Store Plaza West Covina. California. Finish Line Shoe Store Town Center at Aurora. Colorado. Finish Line Shoe Store Cherry Creek. Colorado. Finish Line Shoe Store Danbury Fair Mall. Connecticut. Finish Line Shoe Store Christiana Mall. Delaware. Finish Line Shoe Store Citrus Park Town Center. Florida. Finish Line Shoe Store The Florida Mall. Florida. Finish Line Shoe Store The Gardens Mall. Florida. Finish Line Shoe Store Cumberland Mall. Georgia. Finish Line Shoe Store North Point Mall. Georgia. Finish Line Shoe Store Southlake Mall. Georgia. Finish Line Shoe Store Mall Of Georgia. Georgia. Finish Line Shoe Store Arbor Place Mall. Georgia. Finish Line Shoe Store Stonecrest Mall. Georgia. Finish Line Shoe Store Water Tower Place. Illinois. Finish Line Shoe Store River Oaks Center. Illinois. Finish Line Shoe Store North Riverside Park. Illinois. Finish Line Shoe Store Orland Square. Illinois. Finish Line Shoe Store Fox Valley Center. Illinois. Finish Line Shoe Store Yorktown Center. Illinois. Finish Line Shoe Store Chicago Ridge Mall. Illinois. Finish Line Shoe Store Louis Joliet Mall. Illinois. Finish Line Shoe Store Castleton Square. Indiana. Finish Line Shoe Store Jefferson Mall. Kentucky. Finish Line Shoe Store South Shore Plaza. Massachusetts. Finish Line Shoe Store Annapolis Mall. Maryland. Finish Line Shoe Store St. Charles Town Center. Maryland. Finish Line Shoe Store West County Mall. Missouri. Finish Line Shoe Store Fashion Show Mall. Nevada. Finish Line Shoe Store Garden State Plaza. New Jersey. Finish Line Shoe Store Rockaway Townsquare. New Jersey. Finish Line Shoe Store Woodbridge Center. New Jersey. Finish Line Shoe Store Deptford Mall. New Jersey. Finish Line Shoe Store Kings Plaza. New York. Finish Line Shoe Store Staten Island Mall. New York. Finish Line Shoe Store Queens Center. New York. Finish Line Shoe Store Galleria at Crystal Run. New York. Finish Line Shoe Store Crossgates Mall. New York. Finish Line Shoe Store South Shore Mall. New York. Finish Line Shoe Store Belden Village. Ohio. Finish Line Shoe Store Franklin Park Mall. Ohio. Finish Line Shoe Store Kenwood Towne Centre. Ohio. Finish Line Shoe Store Polaris Fashion Place. Ohio. Finish Line Shoe Store Wolfchase Galleria. Tennessee. Finish Line Shoe Store Town East Mall. Texas. Finish Line Shoe Store North East Mall. Texas. Finish Line Shoe Store Shops at La Cantera. Texas. Finish Line Shoe Store The Parks At Arlington. Texas. Finish Line Shoe Store Barton Creek Square. Texas. Finish Line Shoe Store Houston Galleria. Texas. Finish Line Shoe Store Ingram Park Mall. Texas. Finish Line Shoe Store Deerbrook Mall. Texas. Finish Line Shoe Store First Colony Mall. Texas. Finish Line Shoe Store Memorial City Mall. Texas. Finish Line Shoe Store Willowbrook Mall. Texas. LIMIT ONE TICKET PER CUSTOMER. MULTIPLE ENTRIES FOR MULTIPLE TICKETS WILL BE DISQUALIFIED. On Tuesday 6/20, select stores will be passing out a limited number of tickets for a chance to purchase the shoes on 6/24. To obtain a ticket, you must show a valid photo ID. Each participant will be limited to one ticket, while they last. On your ticket you must include: your full name, shoe size, and telephone number. Tickets will be drawn at random. In the event your ticket is drawn, Finish Line will make one (1) attempt to contact you, at the phone number you provided by 5 PM local time on Thursday 6/22, to notify you of your successful participation in the Finish Line New Release Drawing and opportunity to purchase. 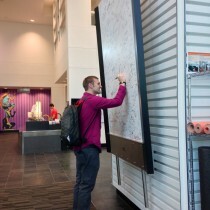 If you do not answer, you are forfeiting your participation in the Finish Line New Release Drawing. If you have not been called by 5 PM local time on Thursday 6/22, your ticket has not been drawn. If your ticket is drawn and you have been contacted, you may redeem your ticket from 8 AM local time to 10 AM local time on the day of the launch 6/24. If you do not arrive with your ticket and valid ID by 10 AM local time, the ticket is no longer valid. You must bring your ticket stub and a valid photo ID that matches the name on the submitted entry in order to purchase the shoe.